Pure white with fierce black eyes. Like a dragon made of ice, cold rather than hot. 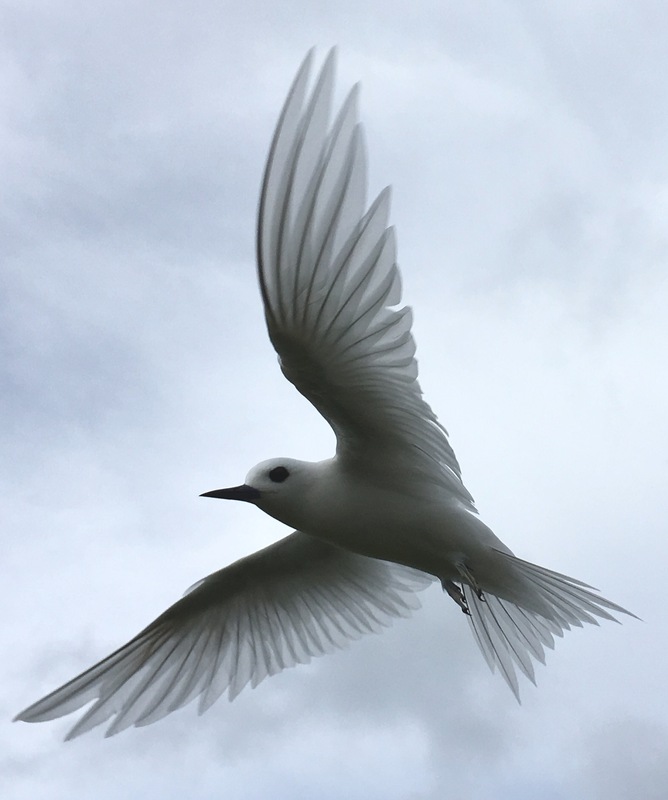 This fairy tern; what is he seeking? Staring straight at me; what does he want? Eyes meet, something transpires, but what? I tell myself, this is a bird, there is nothing there. But look at those eyes. What do those eyes see that I don’t? What stories has he witnessed? What is he telling me? Ah, this is it. Inside, Dragon is fairy tern. The fires burn so hot; all is transmuted to white—the sum of all color—and black—the absence of color. Fairy Tern is the ice formed in Dragon’s core, flies free with all Dragon’s ferocity and purity. Escaping unseen in the fires of Dragon’s breath. Most see a pure white bird—an angel. Wow! The photographs are amazing. The thoughts are beautiful. Why is Dragon a ” he” and angel a “she”? My intention actually is that the fairy tern shifts from he in the first sections to she in the second sections and that Dragon therefore has both genders. I love the shift in gender and the photographs and your writing as allways. Happy new year to you as well, I wish you lots of inspiration and the capacity to see the neverending beauty of nature and life! Thank you for the beautiful thought, Brian. And I wish the same for you this year. Wow! This one is truly great. Among your best yet. Thank you seems so inadequate. But thank you. Oh, this is a fine piece! Something Celtic, Saxon, and Norse about it. It is ancient wisdom to see the beauty of the physical world – and see the power beneath. Funnily enough, my first thought was of an angel in white too, but now that you mention, I can see the ice dragon. It’s the eyes, don’t you think? I was completely mesmerized by this bird. There is something unearthly about it. It means so much that you “see” as well, Nia. Thank you.